India - where to begin? Perhaps one of the most diverse nations in the world, India cannot be truly sampled by just visiting a few regions. The seventh largest country area-wise and second only to China in population, India can be quite intimidating to the uninitiated visitor. Once you get over the shock of the huge crowds, pollution & garbage, chaotic traffic, and poverty, you can then begin to appreciate its beauty. 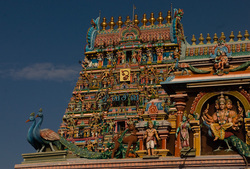 Many of my journeys have taken place in the southern Indian state of Tamil Nadu, known for its elaborate colorful temples. Less visited than the northern, this area and its capital ofChennai can also be a feast for the eye - if you take the time to look.